Waking up on Bank Holiday Monday after a week of frenetic activity for the Bath Comedy Festival has felt a little like being Wile E. Coyote several yards over a cliff edge, with no ground beneath. Back to the workaday author’s world, of staring at email Sent boxes lighting candles and praying to the God of Humanist Atheism and suchlike. But, for all the dodgy gigs arranged by Somerset crazies with about six people in the crowd, for all the singing on stage with my band all night, my cold-wracked voice functioning at about 20% capacity, for all the wonderful fun of reuniting with some of the stalwart Unrelated Family members to do some of our filthy old sketches, it certainly does all feel bloomin’ well worth it, governor. Like many a comedy geek, I had long looked forward to one day meeting the legendary Helen Lederer – but I never envisaged doing so after two hours of rolling around in a pub courtyard dressed in a frock switching between skullcap and roman helmet to portray numerous characters in a live rendition of Life of Brian. Nonetheless, it was probably the most successful Unrehearsed Theatre production to date, thanks to a wonderful ad hoc cast and a very willing crowd, happy to hold up shoes and join in the ‘He IS the messiah!’s and of course, the final singalong. It was about as perfect a text as we could have had for an Easter Saturday – and best of all, we raised £100 for Comic Relief, to make up for stealing the intellectual property of the Pythons. Left to Right: Steph (Judith), Sam (Brian), Elizabeth (Mandy), Matt (Mainly Idle), Gavin (Mainly Palin), Gus (Jesus), Other Matt Inexplicably Dressed as Sherlock Holmes (Mainly Gilliam), Simon (Simon), and Jem (Mainly Cleese). Nonetheless, it was a slightly glowing and dishevelled Roberts who greeted Lady Natasha Letitia Sarah Jane Wellesley Obstromsky Ponsonsky Smythe Smythe Smythe Smythe Smythe Oblomov Boblomov Dob at the Bath Cricket ground afterwards. Having been up and down the country doing author events for The Frood last autumn, I was well used to literary events, but this was my first ever experience as a host, so I’d had a nervous time, watching old episodes of ‘Hello Mum’ (I never did ask her how Clive Mantle is these days, let alone Nick Wilton), and hoping she would ease me into what I would like to think is a whole new line of work. 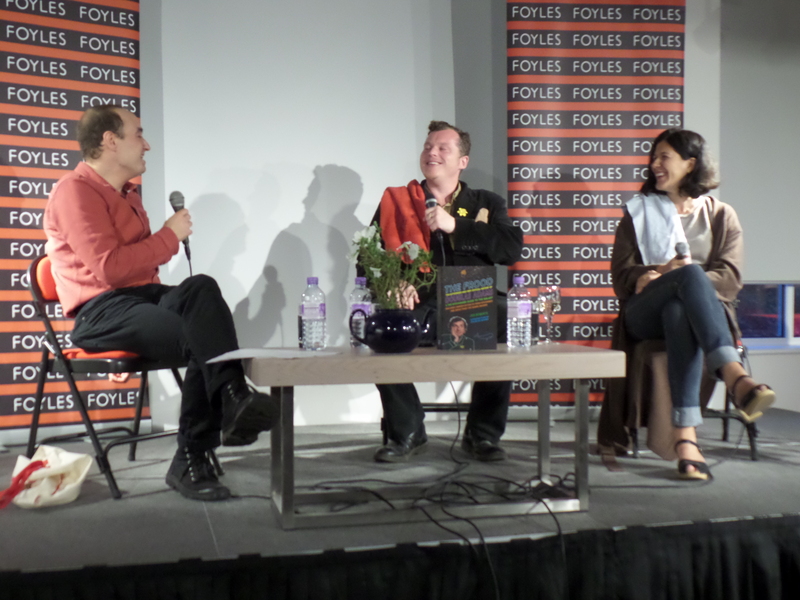 I needn’t have worried, I couldn’t have had a better deflowerer as an on-stage interviewer, and each nudging question I asked Helen thankfully, wonderfully triggered a fountain of sparkling monologue from her, which had the crowds cackling throughout. She was as happy to talk about Rik and Ben as herself, and although her debut novel Losing It was well worth the read (and irresistible to mentally cast with the finest Ab Fab actors as I read), she wasn’t one of those authors who is constantly trying to refer back to it, in fact she wanted the crowd to buy it as unmarked by spoilers as possible. The hour just flashed by. It was always very clear that my second go in the interviewer’s chair was going to present a different challenge, as I have known and interviewed Terry Jones in the past, and by his own admission, he’s not the easiest person to winkle anecdotes out of. When sat with his fellow Pythons, he throws in fascinating vignettes and jokes, but the idea of our Q&A for the Bath Plug Award, sandwiched neatly between a glorious showing of his 1996 underrated classic adaptation of Wind In The Willows, and the previously blogged-about Holy Grail, was that we were celebrating his own career away from the Pythons – Personal Services, Erik The Viking, and of course, Absolutely Anything. This time it was more my job to be there for Terry throughout, guiding him through his career, rather than just nudging him into monologue. I was well prepared, and although I may have ended up speaking ten words to Terry’s every one (which I truly hope wasn’t too onerous for the crowd), there were many happy faces there, just glad to be in the presence of a genuine comedy hero. And he was very pleased to have indirectly raised Comic Relief some cash, even if it was via a gang of pissed actors wrapped in curtains. Muggins, Mandy Mother of Brian, BCF boss Nick Steel. We look like the poor chap’s minders. As a patron of the festival, Terry’s acceptance of the inaugural Bath Plug above all opens the door for whole hosts of huge names to follow in his wake for years to come, which is incredibly kind of him. Having had such nightmares clearing WITW for viewing, we’re already well-immersed in a very exciting idea for the Bath Plug Award 2016, which will quite possibly be announced right here, when we know it’s definitely happening. 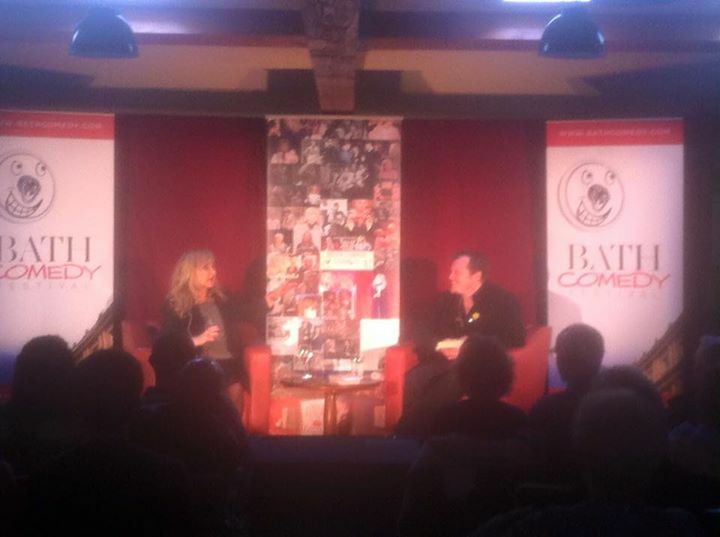 The Bath Comedy Festival originally took me by surprise, when it kicked off several years ago. 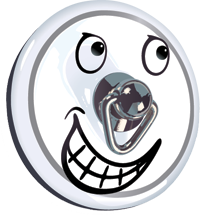 For a while, I felt like I was the only person in the city running any kind of local comedy scene, with The Unrelated Family sketch shows (there was Mirth Control, but this tended to be very catholic stand-up populated by London acts), which I then had to curtail to get stuck into my first book, The Clue Bible. Having moaned about the lack of a comedy scene here for years, it seemed to rather be taking the piss that a whole festival was starting just as I was busy moving onto something else. Our own ragged restaging of that classic comedy out in the courtyard on a (hopefully sunny) Easter Saturday will be just the preamble to the real main event – interviewing the director of that film on stage! I will also first of all be racing from 1st Century Judea to the Bath Cricket Club to interview Alternative comedy hero Helen Lederer about her new book LOSING IT, which is extraordinarily exciting, I look forward to asking her all about the early days with Rik & co, and my books will be available as well as Helen’s… so I hope to see you there! However, the day after, Easter Sunday, will see the launch of what will hopefully become a defining mainstay of the Festival from now on – THE BATH PLUG! 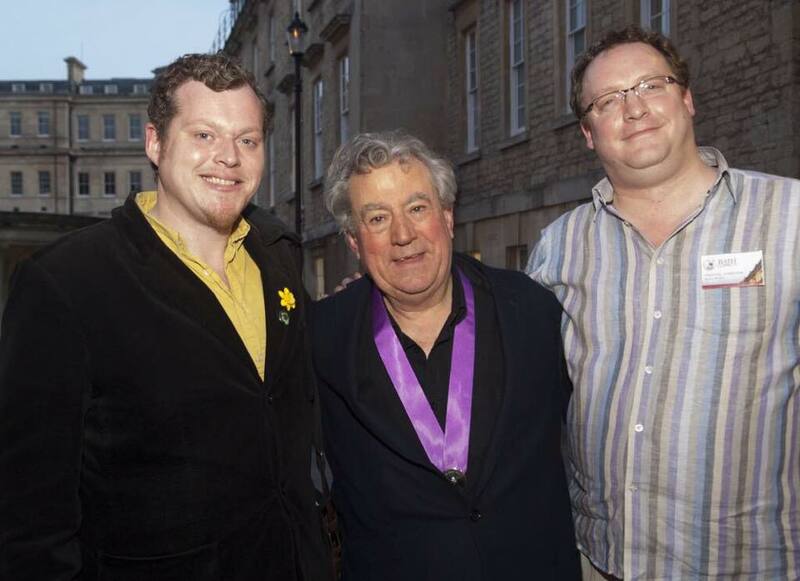 It struck me that having a central award for each year’s festival was always a great excuse to wallow in some great comedy with the very best artists, and as the Bath Festival’s patron, who better to receive the first award than Terry Jones? Hopefully he will be the first of many to appreciate the honour, not least as it’s not a piece of crappy perspex to throw in a dusty cupboard, but a proper gold bath plug, which can even be used if need be. Recipients can also use the event to ‘plug’ whatever they’re up to. Do you see? Do you see how many levels this works on? Thank you, yes you do. Naturally, I’ll be doing all I can to get fresh anecdotes out of the esteemed Python, concentrating on his cinematic career above all else – as an obliging chap, this is one of a dozen Q&As he’ll be doing this season, so I want to make this a distinct celebration of his screen output. Terry himself specifically requested we show his undervalued 1996 adaptation of The Wind In the Willows, and what jollier way to spend Easter afternoon could there be than to join us? And after a break, we’ll chat, and then there’ll be a chance to see Monty Python & The Holy Grail on the big screen. 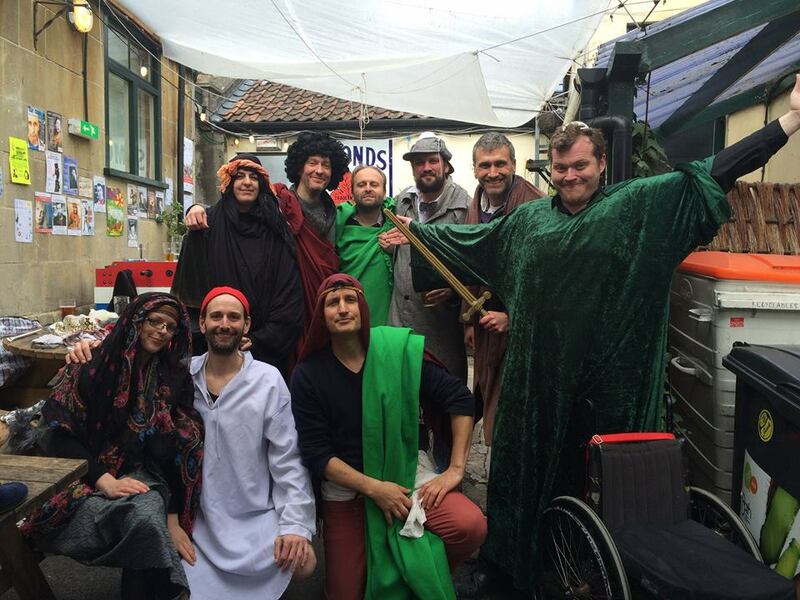 The temptation to put Life of Brian on, on Easter Sunday, was immense, but, well A) We’d already decided to do Unrehearsed Theatre, and B) LoB’s infamous history with cinema bannings etc. means that few films have been re-released into cinemas quite so often. I myself have seen it at least twice on the big screen, and saw Meaning of Life in the cinema last year in Bristol. If it had been up to me (in lieu of Terry’s brand new sci-fi caper ABSOLUTELY ANYTHING, which simply isn’t ready for release yet) we’d have shown And Now For Something Completely Different! Because, yes, it’s not a great film, but what’s the point of doing these things unless you’re showing something really unusual, something you wouldn’t normally find in cinemas? But as it is, the nightmares clearing the 19-year-old WITW movie have been bad enough, we’re only getting to show it due to round-the-clock hard work from Nick Steel, Will Sansom, and producer John Goldstone, so Holy Grail it is. You can’t exactly complain about one of the funniest movies ever made being shown. So at last, we have a jolly Pythonesque Easter evening to look forward to. 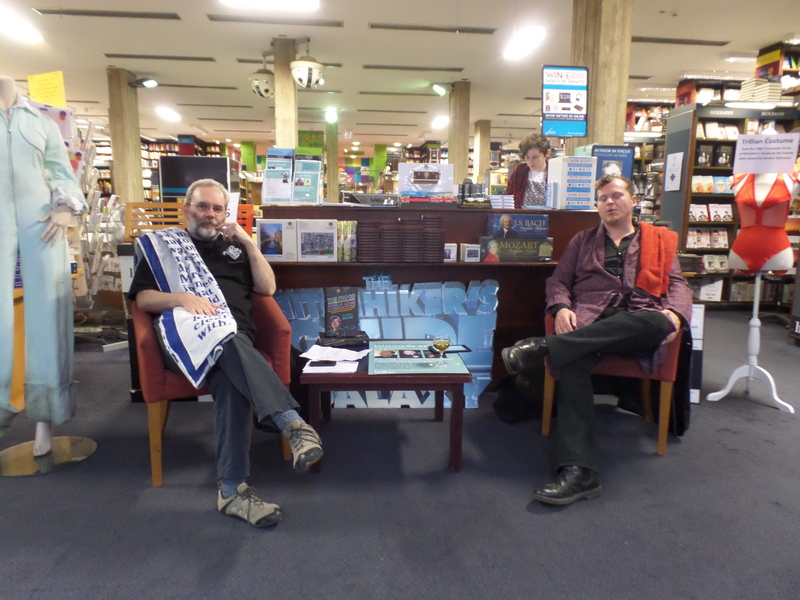 One of these froods is hoopier than the other – me and the remarkable Toby “Slarts” Longworth. Pic taken by the excellently-monikered Janko Dragovic. I may have gone where I intended to go, but I do not think I have ended up where I wanted to be – to subvert the words of an occasionally wise detective – which is another way of saying that the publicity splurges for The Frood brought a lot of pleasure both to me and to audiences around the middle bit of this island… However, it seems that amid the avalanche of selective-memoirs from the likes of Cleese, Merton, Fry et al, even a figure as beloved as Adams can get a bit lost. It may well be that soon it will become illegal to write a book unless you are a celebrity. In short, it occurs to me that a massive shake-up of the way books are published is in order – even though The Frood missed ‘Super Thursday’ by coming out a week or two earlier, there’s simply no commercial sense in squeezing a year’s worth of book releases (many specifically aimed at the exact same readership) into one day in autumn any more – if indeed, there ever was any sense in it. Perhaps a new model will come along, in which books sort of stay in publicity mode for a lot longer, being updated, re-printed (if popular enough), and dusted down for suitable occasions, to help spread the word. For instance, I tend to meet about one person a week who claims to be the biggest Blackadder fan of all time, ever, no comebacks – and almost without exception, these people never even know there is a widely available great big official-as-dammit book on the subject, packed with exclusive material. It looks like The Frood might be a similar situation, Hitchhiker fans the world over need to be told about it – but with every single media outlet in the UK currently being all-but run by unpaid interns , their Culture coverage cut down to around one sentence every second month, how to let them know? I’m currently favouring a special series of supernovae explosions on New Year’s Eve which will spell out “BUY THE FROOD BY JEM” across the firmament – keep an eye out at the end of the month to see if my plans have come to fruition. 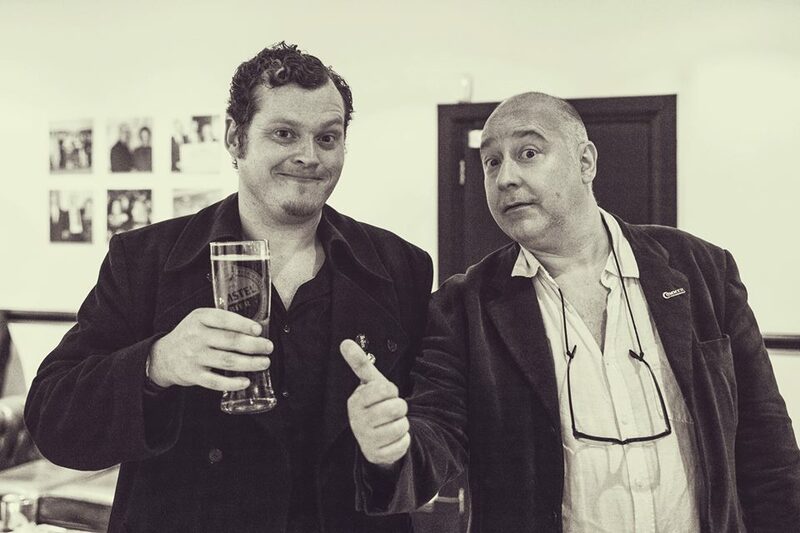 But we also performed some exclusive never-before-seen material – the highlight being our very ad-hoc reconstruction of the beginning of the abandoned Hitchhiker TV Series 2, with Toby standing in for David Dixon and me still failing to capture the brilliance of Simon Jones. Still, my ukulele stayed in my bag (no ‘So Long…’ singalong!) 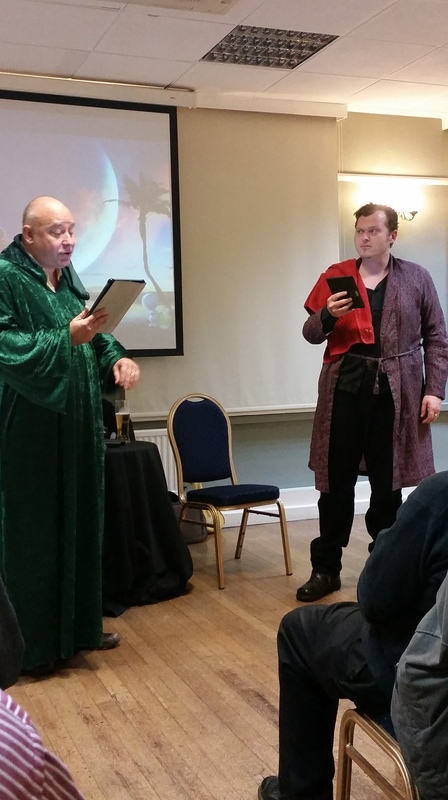 and many laughs were had – I was even stopped in the street and asked about the possibility of further fringey stagings of this Longworth/Roberts ‘show’ as it were, but that would depend totally, like everything else, on the feelings of Douglas Adams’ family and estate. I’m up for it. As the most comprehensive official guide to The Guide in the known Galaxy, The Frood will always be out there now, and as long as my writing does as much justice to Douglas’ memory as people have told me it does, that’s all that really matters. Now, will somebody please buy me lunch?